Today, at almost 4:30 in the afternoon 8:00 at night, I'm getting to write my Not Me! Monday! 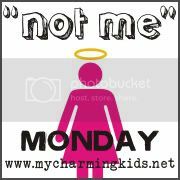 I love me some Not Me! This marvelous blog carnival was created by MckMama - after you get to listen to me whine about my week peruse my Not Me! 's, pop on over to her blog-diggity and check out everyone else's! I did NOT stay home with my sick kid and spend to much time on twitter and blogger last week! I can NOT do much of my work from anywhere. I certainly would NOT ignore that work to "hang out" with my fab bloggie friends! I did NOT have to go to work to do some mandatory computer stuff that was required to be completed by today, and that I have known about for the last, oh, I dunno, two months? I did NOT accomplish that in stages, interrupted by such menial things as lunch with my girls. Finally, I did NOT leave the last stage running so I could flee the office to drop off those blasted boxes of Avon! Finally, I was NOT super excited to have helped a local school's sixth grade classes raise almost $600 for a cool science field trip they are planning for this spring! I did NOT do that by selling a LOT of Avon that I did NOT spend nearly seven hours sorting and bagging on Sunday! Ok, that's some of the things I've NOT been up to! How about you? Feel free to leave yours in comments, or post 'em to your blog, then head over to MckMama's and link up! Holy CRAP! I can't believe all that Avon. You certainly have some major ambition, chica! K so once I get some extra dough I'm so gonna order something from you! PS I think it would be so fun to sell Avon! Oh how I miss my Avon!! I haven't ordered any since I stopped working a little over a year ago. Ditto Mindi... the getting extra dough and ordering... I don't think I'd wanna sell! That is one BOAT LOAD of Avon, girlfriend! I love Avon - it's affordable and they have great products - you go, girl! What a great mom you are! (And ambitious as all get out!) How do you get all your ENERGY???? Coffee- lots and lots of coffee! !